Although ficus trees, also known as figs, are small, tough trees, many are discarded because a ficus can appear to fall apart soon after it comes to a new environment, according to FicusTree.com. New ficus caretakers often don’t realize that leaf loss is common with ficus trees. It's usually caused by excessive or inadequate watering, pests or environmental changes. According to Plant Care.com, a ficus tree can typically shed about 20 percent of its leaves when adjusting to a new environment. The ficus tree is only about 3 to 9 feet tall. It has many spreading branches and a trunk that is rarely more than 7 inches wide. The tree’s root system, which is shallow and spreading, can sometimes cover 50 feet of ground, although in porous soils some roots can be as deep as 20 feet. Ficus trees have leathery, glossy leaves that come in various heights. Ficus leaves are palmate or distinctly lobed. They’re divided into three primary lobes, with the leaf margin irregularly toothed. Although plants are usually light green, older ficus leaves show the most chlorosis, a condition in which leaves become yellow because they fail to produce enough chlorophyll. Ficus trees have fleshy, convex fruits, containing seeds in nut form. The tree’s fruit, which is pear-shaped, is actually a fleshy hollow receptacle, known technically as a synconium. Ficus fruits come in several colors including yellowish-green, copper, dark purple and bronze. Seeds vary in size, from small to large and can include anywhere from 30 to 1,600 for each fruit. Ficus flowers appear inside the receptacle and are extremely small. Ficus Monique is an erect plant with bright, shiny leaves that are crispy and hard at maturity. Unlike most ficus trees, this species does not drop leaves. Besides standard trees, ficus moniques comes in other shapes, such as bushy or topiary forms. 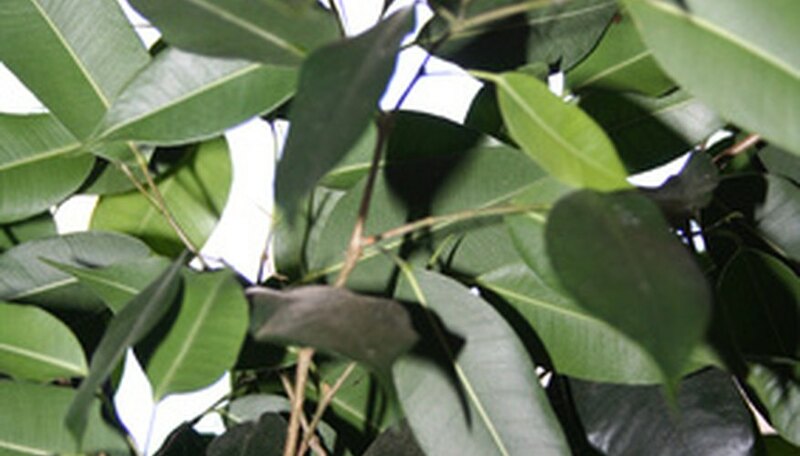 Ficus indigo has dark, thick leaves that grow under extremely low light levels. After emerging green, its leaves become darker to an almost glossy blue-black as they mature. It has a weepy, open look because of its irregular medium or long internodes. Ficus midnight has exceptionally dark blue or black shiny leaves that sit along the stem with extremely close internodes. It grows erect, compact and bushy. The ficus benjamin has poisonous sap in all its plant parts. This ficus, also called the “weeping fig,” can cause skin and allergic reactions, notes North Carolina State University Extension. Wheezing and itchy eyes can occur from frequent contact with a weeping fig. Although symptoms can cause discomfort, they usually last for only a few minutes. The weeping fig is either a tree or evergreen shrub with alternate, simple leaves and drooping branches. Weeping fig leaves are glossy and have long tips. The fig’s flowers and fruit are inside a fleshy sac that turns from green, then becomes orange-red before finally turning purplish black.